South sectional champions — this year in division two. 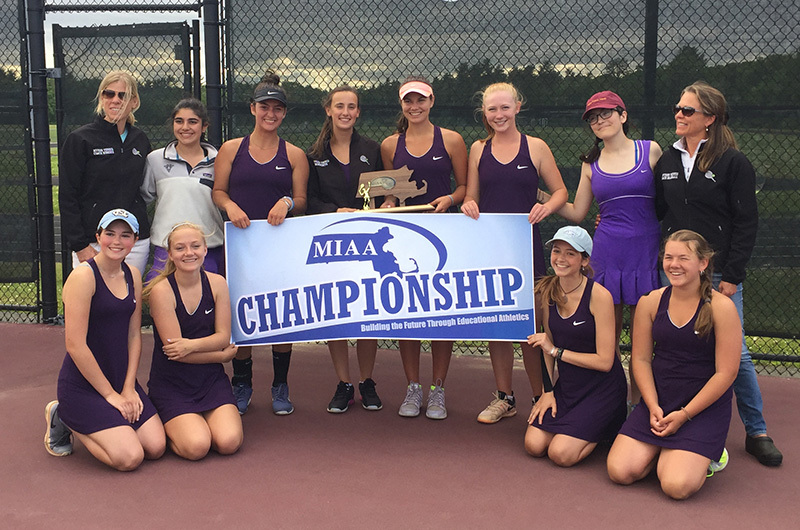 The Martha’s Vineyard Regional High School girls’ tennis team is heading to its fourth straight state championship — and first in division two — after a decisive win in the south sectional finals against the fifth-seeded Foxborough Warriors Thursday afternoon. The state championship match was rescheduled Monday. It will now take place on Tuesday at 3:30 p.m. at Newton North High School. The Vineyarders will play Winchester, first seed in the north. For the first time this year the Vineyard team moved up to division two for tournament play. On Thursday at Old Rochester, seniors and doubles partners Kat Roberts and Lizzie Williamson were the first to knock out their opponents (6-0, 6-0) in their second-to-last match of their high school careers. Junior Victoria Scott cleaned up the next match 6-2, 6-1 before sophomore Hanna Rabasca sealed the Vineyard win 6-2, 6-1, putting the team up 3-0 out of the five matches played. Sophomores Molly Pogue and Chesca Potter were next up and made it a doubles sweep 6-2, 6-3. The only loss of the day came at the hands of the Warriors’ best player who defeated the Vineyard’s first singles player Kelly Klaren 6-3, 6-2. Coach Nina Bramhall was quick to point out that Klaren put up a great fight in the longest match of the day. Ms. Bramhall said it was a happy day full of competitive play.